Occasional Toronto: June Theme Day: "Me"
The theme day for June for the City Daily Photo Blog community is "Me" and I'm sure there will be a lot of reflection pics on display. I like to play Hide & Seek so my pic is a reflection from a distance taken just after I had finished doing repeats up and down the stairs at Casa Loma. 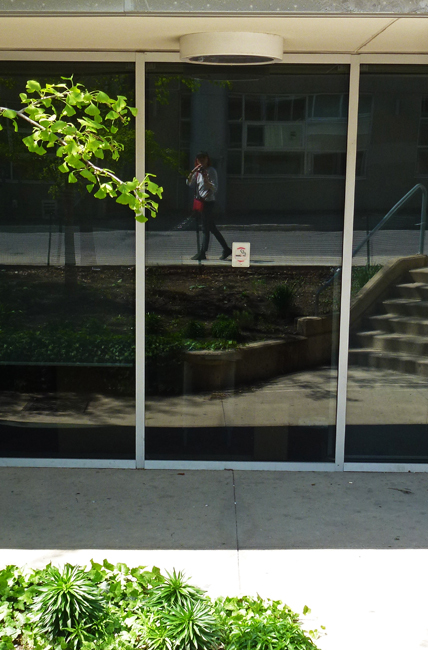 The windows at George Brown College provided a good mirror. To see more examples of the theme "Me" from around the world click HERE. Well done on the stair repeats Pat.. and the reflection shot ☺ Happy weekend. Great selfie and reflection shot. Happy Friday, enjoy your weekend! I love a good reflections photo and this is a great one. Well done, Pat, good reflections photo ! Still being elusive! Excellent take! Well now! There you are! Your reflection works great. Looks like a working photographer. Perfect image for theme day. ...I like to play Hide & Seek too! Yes, reflection shots are another favorite next to shadow selfies. Good choice for the theme. Well, hello there - but I can't really see you! Ah, but you're hiding from us. Possibly on purpose? You should be proud of your "repeats." I'm just delighted to know there are people out there who can still do them! Love you "Me" reflection; it works so well with the theme! Great shot for today's theme! Your shot reminds me of one I have I should have added to my post. I'd forgotten about reflections. It looks as though you wanted us to see through a glass darkly, though, since you are so far away it's hard to see your face. I was hoping to finally see you. You are very, very private.